SIOUX FALLS – Following months of fundraising, Augustana College President Rob Oliver and Athletic Director Bill Gross today announced that construction of the Huether Tennis Centre will begin July 6. 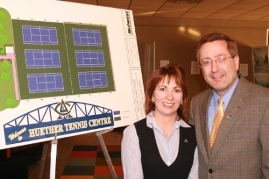 The Huether Tennis Centre (pronounced Hew-ther) will be built on the site of the College’s current tennis facility located east of Grange Avenue between 21st and 33rd Streets. In January, Mike and Cindy Huether of Sioux Falls (shown below, right) came forward with a generous lead gift. Over the past five months, a fundraising team has secured more than $375,000 from 27 different gifts or pledges in support of the project. The Huether Tennis Centre will be spread over 37,400 square feet compared to the current site’s 33,600 square feet. The surface for the six championship-level courts will be widened by 16-feet on the east side. A new entrance and tennis shack will be built on the south side of the facility. A new fence and retaining wall will also be built around the new playing surface. There will also be an area dedicated to recognize donors who have supported the project and have sponsored individual courts. In addition, the facility will include lights on all six courts. According to Gross, construction plans for the Huether Tennis Centre call for the project being completed in October. Midwest Tennis & Track of Denison, Iowa, is the contractor for this project. It is the same company that installed the playing surface at Kirkeby-Over Stadium, Augustana’s new on-campus football stadium which is scheduled to open on September 5 when the Vikings entertain Emporia State. Besides serving as the home for the Viking men’s and women’s tennis teams, Augustana will use the new facility for practice, competition, classes, and recreation. Community use of the tennis courts will also be encouraged. Augustana’s current six-court tennis complex was built in the middle to late 1960s. Before that the courts were located near where Stavig and Granskou residence halls now stand. Tennis was added to Augustana’s athletic program in the 1930s. Between 1947 and 1985 the men’s team won six North Central Conference championships and in 1953 claimed the conference doubles crown. Women’s tennis became part of the NCC program in 1981 and Augustana claimed the league title the following year.